Environmentally safe and ideal for protecting delicate electronic equipment, the Kidde 466180 Pro 5 CD Fire Extinguisher leaves no residue behind as it effectively extinguishes Class B (liquids and gases) and Class C (energized electrical equipment) fires. This durable carbon dioxide extinguisher comes with a UL-approved wall hanger. Featuring a sturdy aluminum cylinder, brass valve, and stainless steel handle for a durable extinguisher you can trust. Responsive and easy to use, the Pro 5 CD Fire Extinguisher takes care of fires quickly and easily. 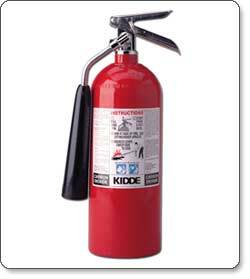 This carbon dioxide extinguisher contains an average of 5 pounds of fire extinguishing agent. It operates at 850 psi and is designed to handle Class B and Class C fires. A clear instruction label on the front of the extinguisher guides you through the steps of operation. Environmentally safe, the Pro 5 CD uses a carbon dioxide (CO2) extinguishing agent, which dissipates quickly, leaving no residue behind. The CO2 won’t contaminate valuable materials, or electronics, so it’s safe to use in home offices and more. Built to last, the Pro 5 features a sturdy, aluminum cylinder with a durable, epoxy paint finish in red, as well as an impact-resistant, long-lasting, nickel-chrome-plated brass valve with stainless steel handle and lever. The Pro 5 is UL rated at 5-B:C and includes a UL-approved wall hanger. It is backed by a five-year limited warranty. Renowned for global leadership in fire detection and suppression, Kidde provides solutions ranging from portable fire extinguishers to advanced industrial controls such as flame detection and explosion suppression systems. Kidde is a UTC Fire and Security brand, with a history that’s rich with innovations, from the patent of the Chubb Detector Lock in 1818 to the development of the world’s first wireless networked smoke detectors in 2004. Kidde Pro 5 CD Fire Extinguisher, wall hanger, and installation guide. Pool Alarm Electronic Monitoring System.